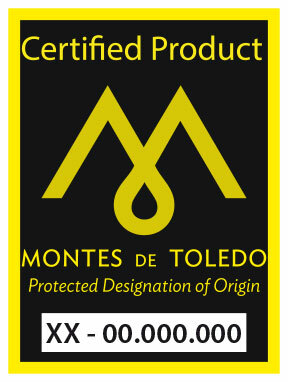 The conformity mark, a back-label fixed to the container, guarantees that the oils held within meet the requirements specified under the Protected Appellation of Origin “Montes de Toledo”. 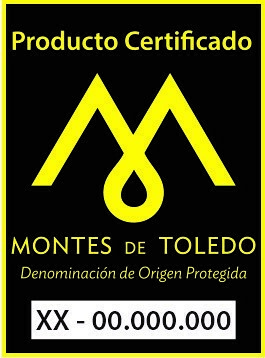 The oils protected by Denominación de Origen Protegida Montes de Toledo (D.O.P.) (Protected Appellation of Origin), must meet the demanding product specifications established which regulate their production process (Regl. (CE) 1187 / 2000 and (UE) 593 / 2010). These specifications cover all the stages of production and guarantee not only the origin of the product, the main differentiating characteristic, but also its traceability. It details the required conditions of the olive groves, their harvest, the transportation of the olives, as well as the processing of the olive fruit and its storage and packaging; without forgetting the physicochemical and organoleptic features. Prior to the certification of each product, assessment is carried out of both the supplier facilities and its production processes to ensure the requirements are met. Not only that, but physicochemical and organoleptic analyses are carried out during this evaluation using samples taken to the effect. Hereon, the supervisory body has a surveillance plan in place that covers all the stages of the commercial life of the oils, including product sampling for later analysis. The Tasting Panel Foundation, recognized by the Consejo Oleicola International (COI), (International Oil Production Council) alongside prestigious independent laboratories, carry out these analyses. Additionally, there is a penalty system for potential offenders which may even result in loss of user licence of the conformity mark. All these controls are carried out by the Fundación Consejo Regulador de la Denominación del Origen Montes de Toledo (Regulatory Council of the Appellation of Origin Montes de Toledo Foundation) in accordance with the International Standard UNE-EN-ISO-45011. This authority is accredited by the Entidad Nacional de Acreditación (ENAC) (National Accreditation Body) with number 13/C-PRO33 for the certification of the products defined in the specification. This accreditation reinforces the trustworthy profile at an international level of the technical capacity of the certifying authority, its independence and impartiality.